My dog says today the pups are stepping aside and handing over the blog to KitCat, our in-house kitty reviewer! 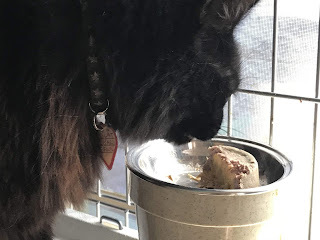 This week, KitCat checks out Solid Gold Triple Layer wet cat food. Without further adieu, let's get on with the show! The Solid Gold Triple Layer has three amazing textures to it: pate, mousse, and shreds! The mousse is pumpkin and the shreds and pate are both meat protein. This food is for all ages, from kitten to senior. The layered style is a nice way to introduce different types of food to a kitten, especially, so he/she gets used to a variety of consistencies at a young age. As always, we pay extra close attention to the first several ingredients in every food we test. For this variety, we found: chicken, turkey, pumpkin, egg white, whole egg, and tuna. That sounds like something yummy you'd make for a Sunday brunch, doesn't it? Both grain and gluten free, this recipe is void of fillers like corn, wheat, and soy. There are also no artificial preservatives or flavors, and no carrageenan or BPA. What there is, though, is lots of meat protein and fiber-rich pumpkin which aids with healthy digestion. KitCat sauntered over to the food and ate about half of it. He went back to his dish to polish it off a short time later. He ate all of food (we gave him a half cup at a time), but he didn't scarf it down like the Solid Gold Purrfect Pairings. Therefore, we give the Triple Layer three and a half out of four paws. We've never given KitCat pumpkin before, so undoubtedly that was a new flavor and texture to him. These wet food cups are filled with quality ingredients that we're really happy about, though, so we're going to try some of the other Triple Layer varieties to see if we find another flavor he might prefer (we got the turkey flavor, but there are also salmon, beef, and chicken recipes available). 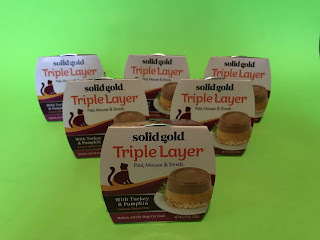 The Solid Gold Triple Layer Mousse with Shreds is available on Chewy.com in a 6-cup case. Each cup is a good 2.75 ounce serving. If your cat is a finicky eater, having three types of food in one cup may be just what you need. 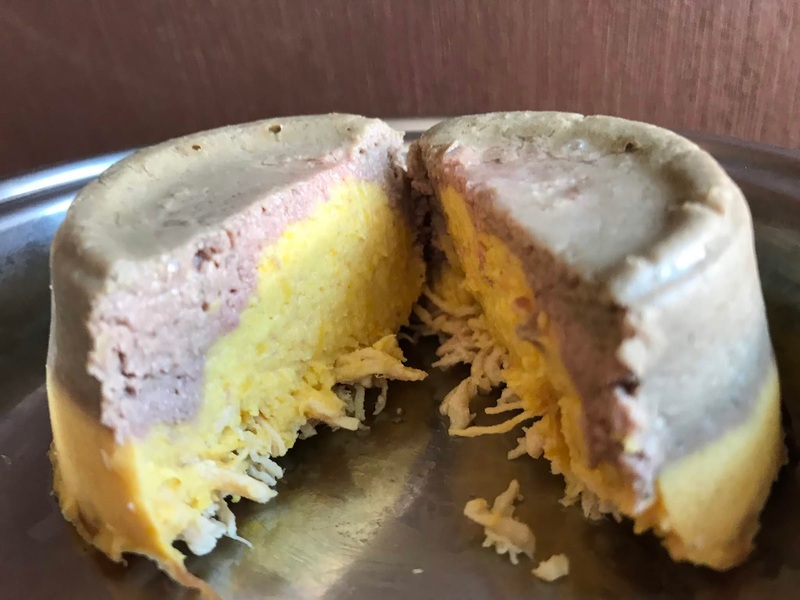 The pate/mousse/shreds combo cup is a brilliant idea and we look forward to trying other Triple Layer flavors in the future! Disclaimer: As a Chewy influencer, we received this product for free so we could sample it. Our reviews, however, are not bought or paid for and you can count on My Dog Says Woof to give you an honest assessment in all our product reviews.